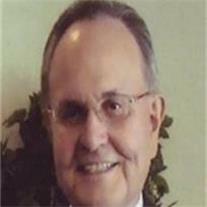 John Lee Anderson, 69, died March 14, 2003 at his home in Mesa, AZ. He was born August 24, 1943 in Oak City, UT to Mark B and Vada Allen Anderson. He grew up in Lakeshore, UT and attended Spanish Fork High School, graduating in 1961. John served in the Utah National Guard from 1961 to 1967, graduated from BYU with a degree in Business Management and served an LDS mission in the Northwestern States. He also served as a Bishop in the LDS Church, a 3 year mission at the Florence, AZ Prison and worked in the youth programs for many years. John worked for John Deere and Co. for 24 years and as a regional manager for Long Term Care Insurance for 16 years. He enjoyed his grandchildren, golfing, walking his dogs, teaching, gardening, and going to Pine, AZ. He is survived by his wife Sarah A. Stewart of Payson, UT, 3 children, Mark Wm. (Velia) Anderson, Mariann (Brad) Goodfellow of Mesa, AZ, Paul John (Debbie) Anderson, St. George, UT, and 12 grandchildren. Funeral services are Saturday, March 23, 2013 at 12 noon, preceded by a visitation at 10 AM at the LDS Estate Groves Ward, 3920 E. Brown Rd., Mesa, 85205 and Monday, March 25, 2013 at 10 AM at Walker Mortuary, Spanish Fork, UT. Burial will follow at the Spanish Fork Cemetery. In lieu of flowers donations may be made to the LDS Missionary Program, c/o Bishop Jim Morris, HC1, Box 1441, Pine, AZ 85544.